The well attended sale, with visitors from France and Holland present, succeeded in selling 100% of the 115 lots on offer. This auction, took off immediately, starting with Lot 501 selling above estimate for £270 (E£200/250). 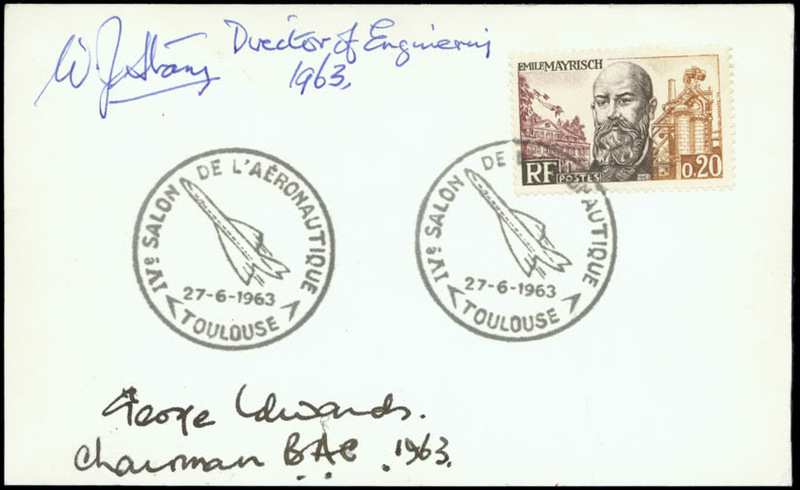 Important results were the 1969 ( Mar 2) (Lot 504) French commemorative first flight cover, signed by French Test Pilot André Turcat, British Test Pilot Brian Trubshaw and others for £750 (E£300/400). 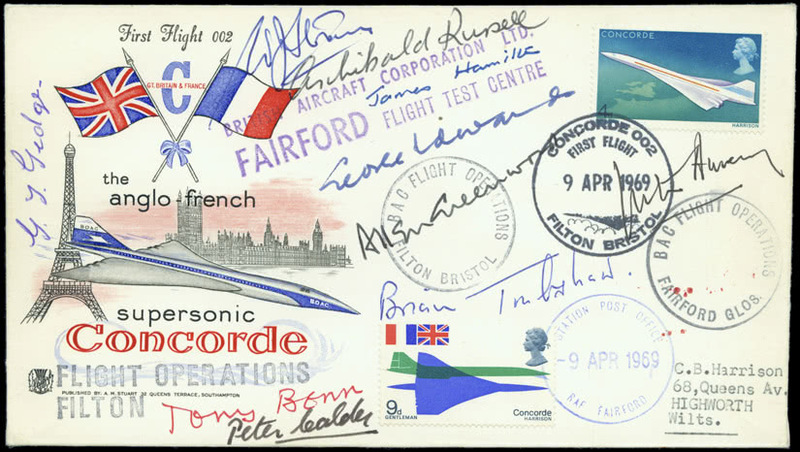 1969 (Apr.9) (Lot 511) British First Flight cover, signed Brian Trubshaw and others sold at £700 (E£300/400). 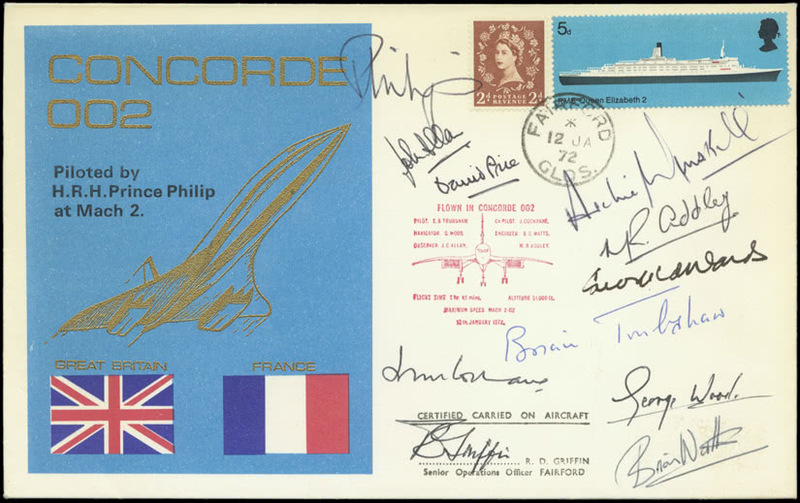 Lot 531, 1972 (Jan.12) flown and signed by Prince Philip and others was the first lot to take us supersonically through the £1,000 barrier to realise £1,350 (E£300/400). 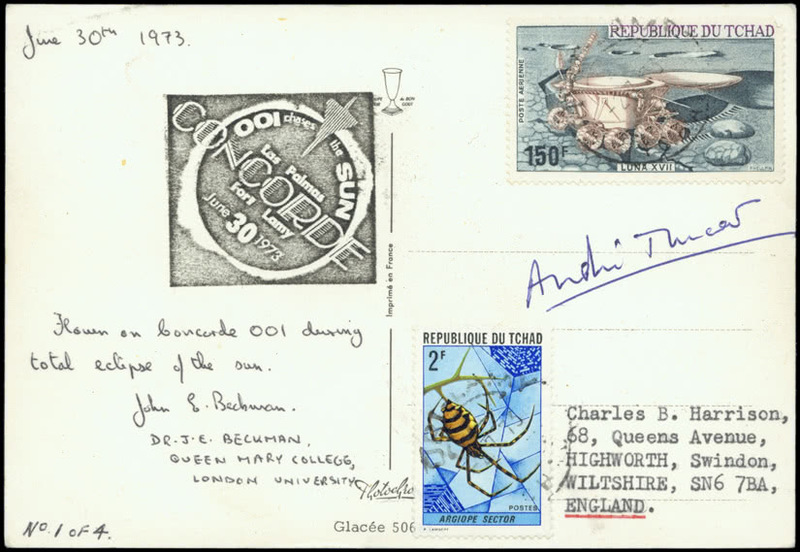 This was followed by Lot 540, the 1973 (June 3) African Total Solar Eclipse card (1 of 4) certified flown by British scientist John E. Beckman and Pilot André Turcat which went for £1,050 (E£150/200). 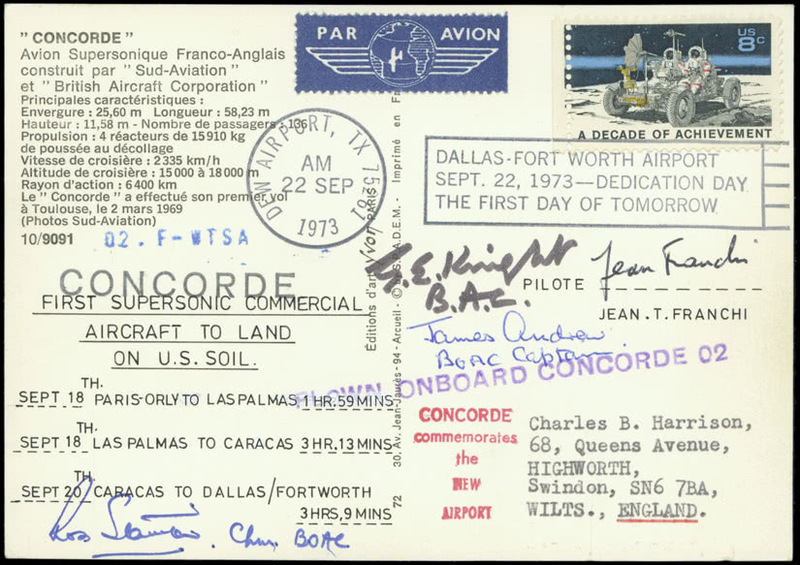 The First Visit of Concorde to the USA, Lot 543, 1973 (Sept 18-20) card carried on 002, F-WTSA, signed by the Pilot Jean Franchi and three passengers (thought to be unique) realised £800 (E£150/200). 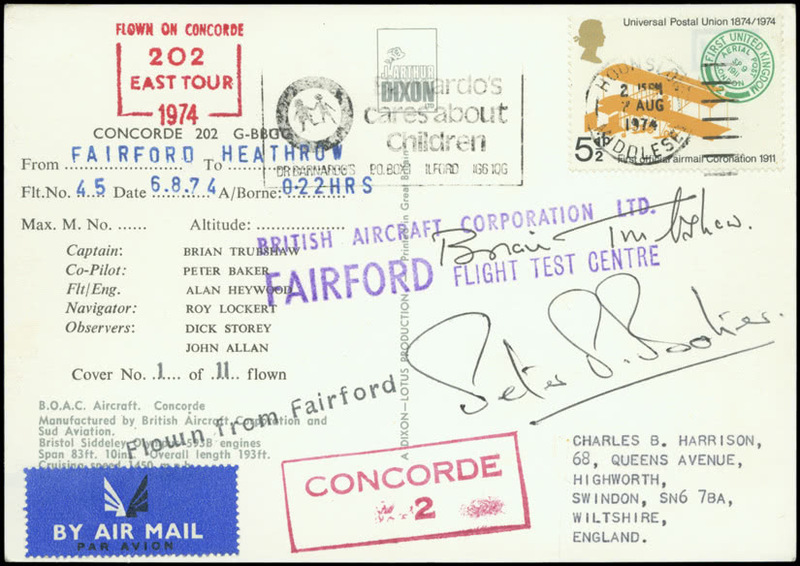 The highest price in the sale was £1,450 for Lot 557, 1974 (Aug. 6 – Sept.13) Middle & Far East Development Tour, a selection of seven flown cards and a cover all signed by various pilots and crew (E£300/400). 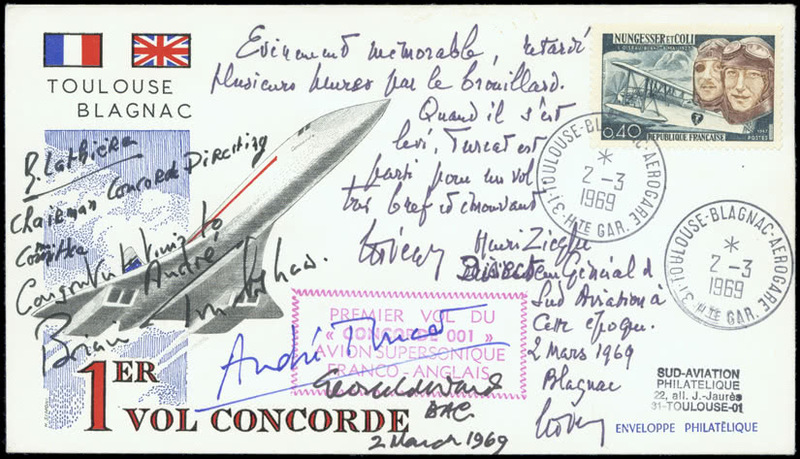 Virtually every lot was contested by the enthusiastic bidders and, proving the continuing popularity of Concorde, although no longer in service. All too soon we were brought down to earth with the last lot No. 615, an Accumulation of Hovercraft Mail, which sold for £520 (E£300/400).